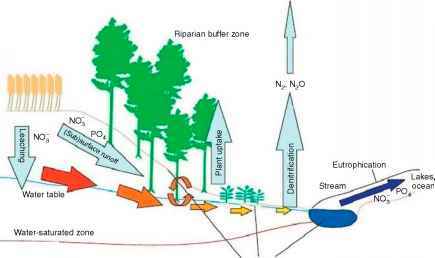 This model is based on the dominant ecohydrological processes in tidal estuaries. The model is best suited to estuaries that are fairly well mixed vertically. In practice this constraint is adequate for many applications because critical conditions in estuaries commonly arise during low flow conditions brought upon by dams and water extraction. These conditions are exacerbated by excess nutrients from, typically, sewage discharge, effluent from feedlots, and fertilizers from farming. Thus the physical submodel, sketched in Figure 1 , views the estuary as a series of connecting cells that exchange water by advec tion as result of the river runoff and the saltwater inflow, and by tidal mixing. The upstream cell receives fresh water, sediment, nutrient, and freshwater plankton. The downstream cell receives seawater and marine sediment, nutrients, and plankton. Cells can also exchange water and particulates with fringing wetlands both in the fresh and the saline region of the estuary. The physical pro cesses and the open boundary conditions control the salinity distribution and the suspended solid concentra tion (SSC; both are sketched in Figure 1). An estuarine turbidity maximum (ETM) commonly prevails. The sali nity and SSC distribution vary both spatially and temporally.